Gayle Wilson is a two-time RITA® Award winner, taking home the RITA® Award for Best Romantic Suspense Novel in 2000 and for Best Romantic Novella in 2004. In addition to twice winning the prestigious RITA® Award, Gayle’s books have garnered more than 50 other awards and nominations, including most recently the Daphne du Maurier Award for the Best Single Title Romantic Suspense of 2008, awarded to Victim, her latest novel from MIRA. Gayle holds a master’s degree in secondary education, with additional certification in the education of the gifted. 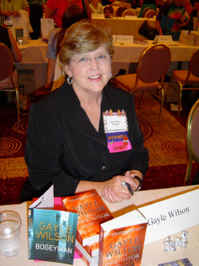 Although her specialty was teaching honors and gifted students, as a former high school history and English teacher, she taught everything from remedial reading to Shakespeare—and loved every minute Gayle Wilson is a two-time RITA® Award winner, taking home the RITA® Award for Best Romantic Suspense Novel in 2000 and for Best Romantic Novella in 2004. In addition to twice winning the prestigious RITA® Award, Gayle’s books have garnered more than 50 other awards and nominations, including most recently the Daphne du Maurier Award for the Best Single Title Romantic Suspense of 2008, awarded to Victim, her latest novel from MIRA. Gayle holds a master’s degree in secondary education, with additional certification in the education of the gifted. Although her specialty was teaching honors and gifted students, as a former high school history and English teacher, she taught everything from remedial reading to Shakespeare—and loved every minute she spent in the classroom. Gayle was on the board of directors of Romance Writers of America for four years. In 2006 she served as the president of RWA, the largest genre-writers’ organization in the world. “What’s going on here?” asked a deep voice at her elbow. Is this you? Let us know. If not, help out and invite Gayle to Goodreads.